This cream giving you perfect skin glow and keeps your skin soft and smooth. 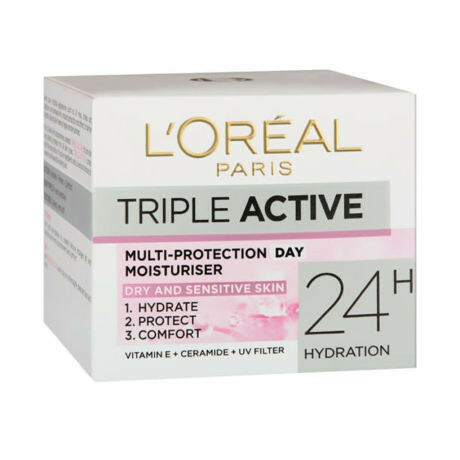 L'Oreal Triple Active Multi Protection Day Moisturiser Give your face the hydration it needs with a moisturizer formulated with actives to restore healthy skin. Light and soft Texture: The velvety, non-greasy, indulgent texture instantly sinks into the skin. It leaves dry and sensitive skin feeling soft and silky. Triple Action: Long Lasting Hydration Enriched with glycerin, the formula improves the skin's ability to retain water and maintain skin hydration.